This Month’s Book: Bear & Hare Where’s Bear? Our Cover to Cover Book of the Month for September is Bear & Hare Where’s Bear? by Emily Gravett. 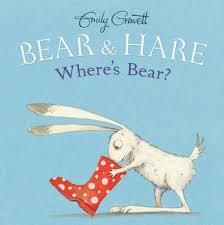 You can COUNT on loving this fun story that follows Bear & Hare on an adventure of hide and seek! Bear & Hare: Where’s Bear? is an adorable book about play, making it perfect for children! Bear tries hard to find a perfect hiding spot for hide and seek, but being a big bear makes it difficult to hide! Invite your child to try and find Bear and Hare in the illustrations. Talk with your child about the hiding spots and ask open ended questions: “Was it hard to find bear behind the fish tank? Why do you think it was so easy to find him? Where could bear hide in our house so that we couldn’t find him? Elaborate on the concept of counting and promote numeral identification by pointing to the numbers in the book as you count along with Bear and Hare. While you do this, your child will begin to identify quantities, an important early math skill! Recreate the story and play a game of hide and seek with your child! Try a different version of this game: instead of hiding from each other, hide one of your child’s toys. Use the words “hot,” “warm,” and “cold” to guide your child to the object. The closer your child gets to finding their toy, the hotter it gets! Send a picture of you and your child playing hide and seek! Be creative! We can’t wait to see what you loved about Bear & Hare Where’s Bear?